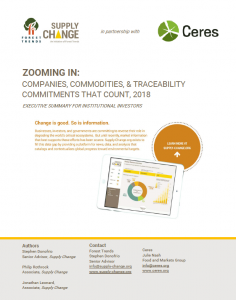 “Zooming In” presents new analysis by Forest Trends’ Supply Change Initiative and Ceres about how companies that are committed to addressing commodity-driven deforestation are tracing supplies to their origin—be it factory, farm, field, or forest—so they can determine the impact their supply chains have on forests. Companies with exposure to deforestation in their supply chains may face material financial risks such as supply disruption, cost volatility, and reputational damage as a result of this exposure. Investors recognize that the profitability of many consumer goods companies depends on secure access to a supply chain that is free from deforestation. To manage these risks, an increasing number of companies have developed policies to address commodity-driven deforestation and to trace their supply chains. Supply Change, Ceres, Green Century Capital Management, and CDP discussed this new research and its implications for businesses, investors, civil society, and other stakeholders.